UPDATE: Build not intended for technical analysis. Our apologies! 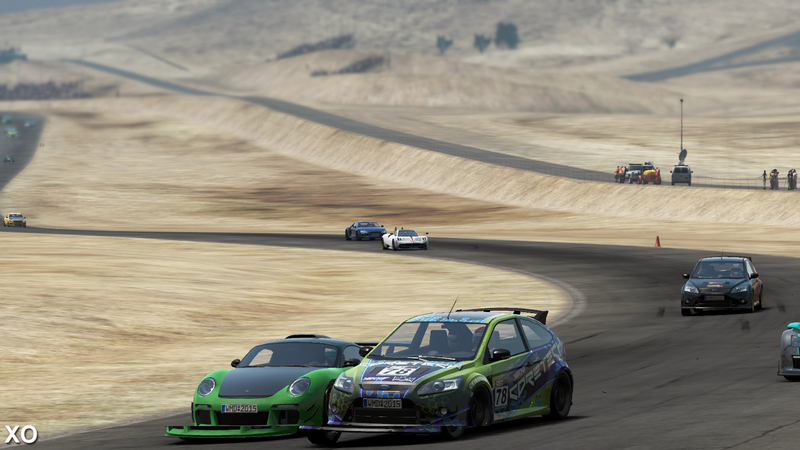 UPDATE: It's come to our attention that the build of Project Cars used as the basis for this article was not intended by the developer Slightly Mad Studios for technical analysis. We weren't aware of this, which was the unfortunate result of some miscommunication on our part with the game's publisher. It was an honest mistake and it is not our intention to misrepresent the game, so we've unpublished the videos that form the basis of the article. We'll be able to bring you a full analysis of a more advanced build of the game in the coming weeks. We'd like to apologise to our readers and to Slightly Mad Studios for this unintentional misrepresentation. ORIGINAL ARTICLE: Thanks to a recent Bandai Namco event, the latest console build of Project Cars is up for analysis ahead of its 8th May launch. 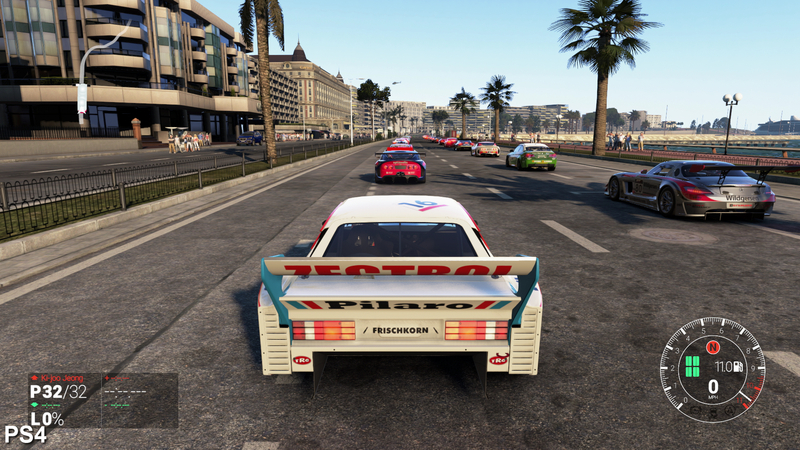 Until now, delays upon delays have denied PlayStation 4 and Xbox One owners a firm grasp on what this PC-borne title brings to the racing sim space. Slightly Mad Studios' work is a technical tour-de-force on PC of course - a brutal stress-test for any GPU when maxed out - but on current evidence the results on console are mixed. As a disclaimer, we're told by Bandai Namco's PR staff that the 19GB build in test here is of 'submission' quality. A final certification pass is ongoing at Sony and Microsoft's offices, and we're still shy of a last word on whether this is what we can expect on launch. At the very least, our captures here show Project Cars in its final stages of development, but as ever, certain points are apt to change as we hone in on its release. Looking at resolution first there's clearly some work to be done. We were originally promised promised a true 1920x1080 as the target for both consoles, but now we see just an internal 1600x900 frame-buffer in effect on Xbox One - as confirmed by the developer earlier this week. Image quality does suffer in this case, and its post-process anti-aliasing method (which falls close to the PC's higher FXAA settings) struggles to cover all its rough spots. A motion blur effect helps disguise the upscale to 1080p to an extent in motion, but pixel-crawl remains noticeable across chrome highlights on cars, and foliage elements especially. Meanwhile, PS4 goes all-out with a pure 1080p output. Jagged edges still flare up across the game, but as you can see in our zoomer gallery below, stair-stepping over mesh fences is less aggressive on Sony's machine overall. Sadly, this setup is unchanged for replays on PS4 and Xbox One - a missed opportunity to show each car and track at their best when player input isn't a priority. The game's frame-rate is also a sticking point. 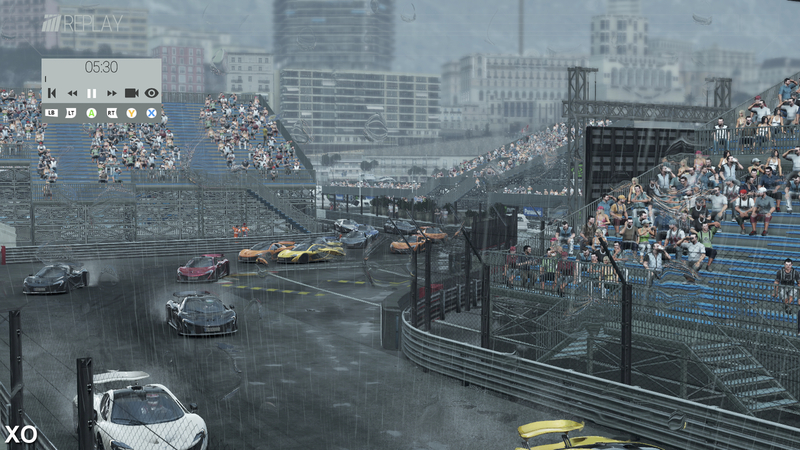 Project Cars targets an ambitious 60fps on each platform, but the sheer breadth of options gives players the power to determine whether it hits this mark, or drops closer to 30fps. For example, our first race is on the Dubai Autodrome International circuit, a manic 35-car race with light clouds overhead, camera set to interior cockpit view and no damage physics enabled. 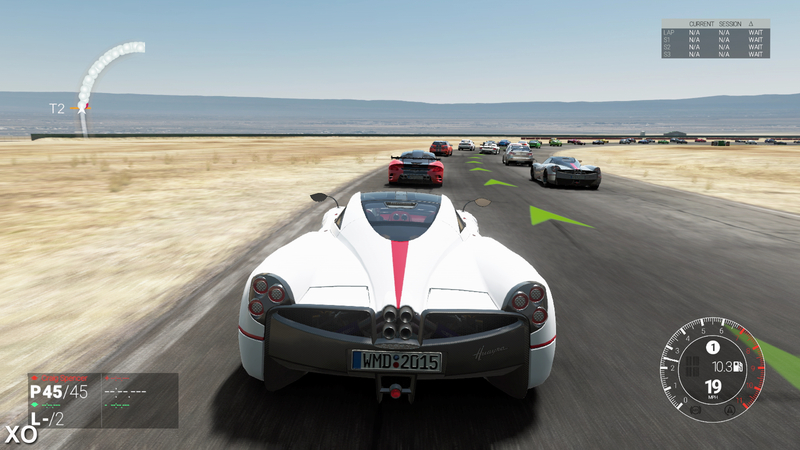 Even with this number of AI racers, the game sticks to a 60fps line throughout, and only drops for one stretch on the circuit (to 50fps on Xbox One, and 55fps on PS4). For moments where the frame-rate goes under, tearing is an issue - especially on sharp turns with lots of camera motion. 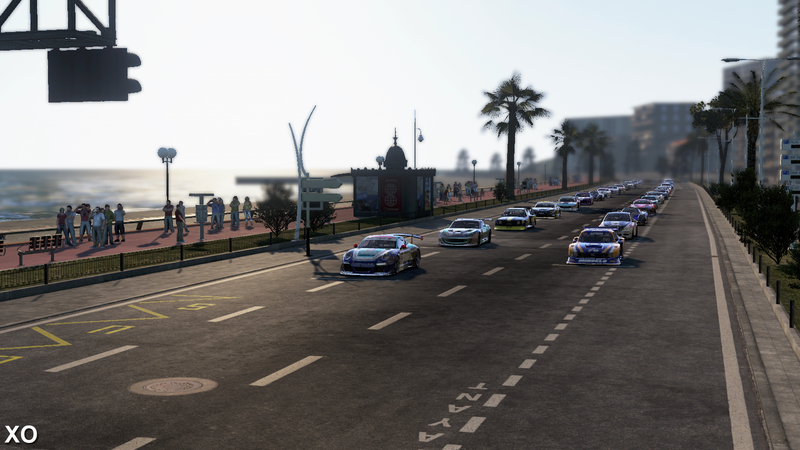 This is a bigger deal once we push the boat out a bit more; our next race featuring a whopping 44 cars on the Circuit Des 24 Heures du Mans track, with a more taxing chase mode camera and heavy rain in play. The impact is immediate, and PS4 tears constantly with drops to 35fps at the busy starting grid, while Xbox One breaches the high 20s. This improves over the course of the race as cars splinter off into packs, though we never catch a glimpse of the 60fps line. It's a night-and-day difference compared to our first track experience. At 30-40fps, Project Cars' controls are less responsive and at times sluggish, while image quality is dragged down by the tearing artefacts. 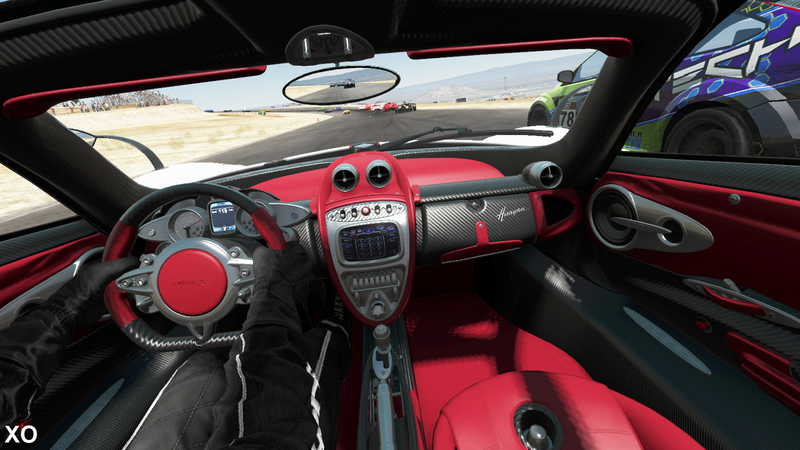 Switching back to cockpit view reduces these drops, but having such a high number of cars on-screen still has both consoles struggling. It's a high price to pay to have all these options enabled. Given that such a peak frame-rate is so far out of reach, a capped 30fps option on console would have been very useful. Draw distances are on par between PS4 and Xbox One in this build, and tracks are nicely lit by a dynamic lighting system. The Sony console's native 1080p resolution helps it to stand above Xbox One's 900p output however, especially on thinner details such as meshes and trees. Both PS4 and Xbox One feature matching post-process effects such as bloom and crepuscular rays. Curiously, each of those are options that can be tweaked in the console menus. Full-screen motion blur is in effect for both consoles, but Xbox One's approach is different to the PS4's, producing smoother results with less banding. 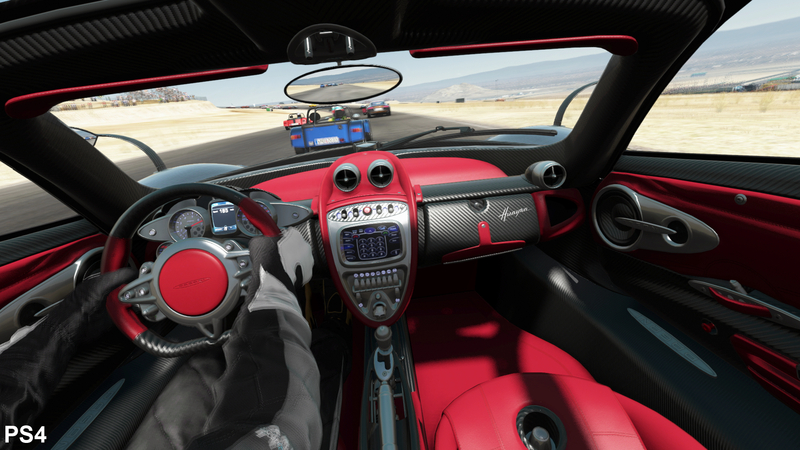 Interior detail on the Pagani Huayra is matched right down to the leather texturing, though dynamic shadows (bottom-right) are higher quality on PS4. Texture filtering is superior on Xbox One, with PS4's texture maps appearing blurred from wide angles such as this. Meanwhile we see PS4 brings a unique approach to per-object motion blur. This isn't seen on Xbox One in any mode, though the banding artefacts may not be to every taste. Fence-work and stadia scaffolds suffer in particular for the Xbox One's lower 1600x900 native resolution. Screen-space effects such as dirt and rain are evenly matched on the other hand, and likewise for reflection quality. Last but not least, the cars themselves. Geometry quality is entirely even between the two, both in-game and in the garage. 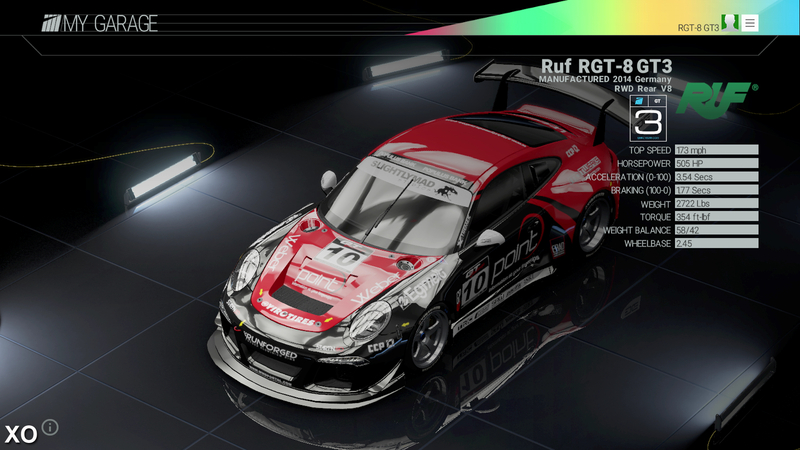 However certain details are missing on PS4 here, such as elements of this car's fender. Finally, we push the Madness Engine one step further by engaging damage physics on each platform, selecting thunderstorms for weather, and this time allowing multiple car types on the Imola circuit. The hit on PS4 and Xbox One performance is huge; Microsoft's console puts in a result that lingers around the 30fps line, with its lowest read-out at 24fps. Meanwhile, PS4 has a rocky time with an output closer to 40fps (though it still wavers up and down), and a minimum rate of 30fps. We have a clear victor during these stress-tests, and it's fair to say that the PS4 edition does feel smoother in practice, though it's still far from ideal. On an optimistic note, Project Cars' range of lighting effects is impressive. Both consoles boast an extensive visual effects menu to tweak each aspect of its post-process pipeline. Though not as full-bodied as the PC's full graphics menu, where e can expect traditional textures, shadows and geometry toggles, we do get a level of flexibility here rarely seen on console. Extras like crepuscular rays, bloom and lens flare are all fair game for a player to tweak themselves - and there's even a field of view slider for each camera type. We enable all post-process effects for our tests, but the actual impact (if any) on PS4 and Xbox One performance for each setting is an area we hope to investigate on release. Speaking of visuals, the PS4 and Xbox One are divided by more than just resolution. Looking at matched shots, PS4 uses a superior grade of shadows than Xbox One that gives it smoother, more refined lines. By comparison, Microsoft's platform is limited to aliased lines of of shade, mostly noticed around the cockpit during clear, sunny weather. 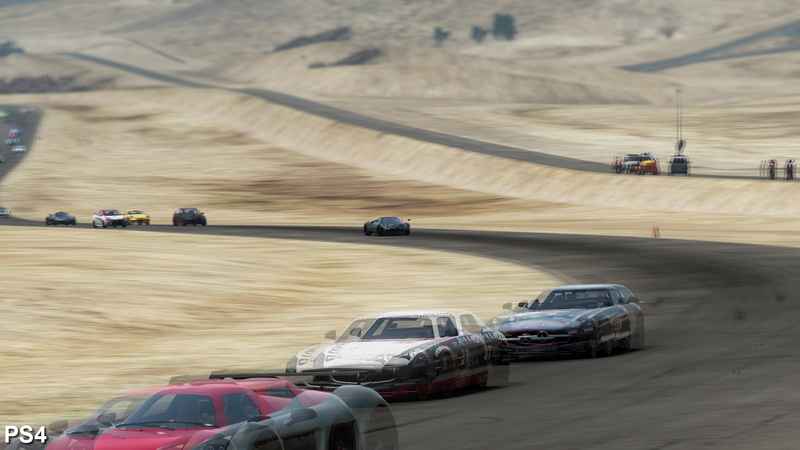 The difference is tricky to catch in most camera modes, but it's a Sony advantage that nevertheless helps Project Cars hold up during replays. As for the rest, world detail draws in at equivalent quality, lighting effects are like-for-like, and texture maps are matched for resolution too. However, PS4 lets itself down on the texture filtering front; terrain on Xbox One is clearer and sharper at low angles, while the Sony release appears blurred over. Neither comes close to the PC's 16x anisotropic filtering setting - and in fact the results are woeful on both sides - but we're yet again looking at a shortfall in PS4's filtering quality that really shouldn't be an issue. Both PS4 and Xbox One offer a surprising number of visual effects options in the build tested - a rare sight on console. PC adds a separate menu for graphics settings like textures and shadows, but even so this puts more control into the console player's hands. On a final note, the current PS4 build uses a different form of motion blur to Xbox One's (and indeed PC's at any setting). 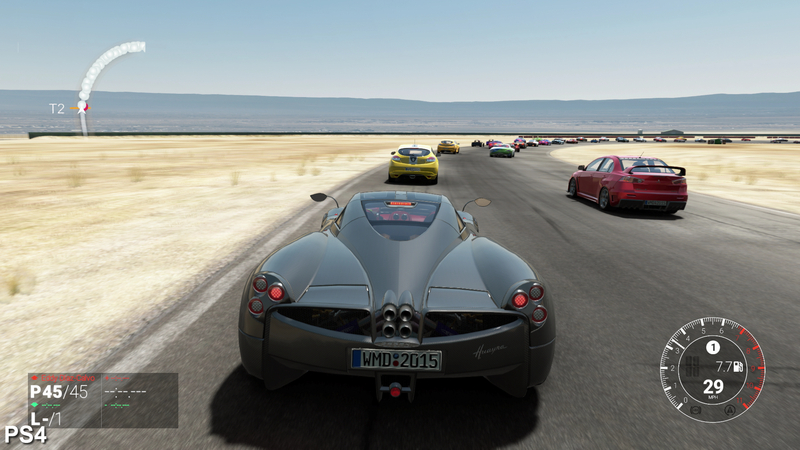 Unlike other versions of Project Cars, PS4 pushes for per-object motion blur that affects each car as they rocket past, entirely independent of the screen. Unfortunately, the method isn't flattering, with its low sample rate causing obvious banding behind each racer. Xbox One puts in a stronger effort overall, and though it misses the per-object version of the effect, its full-screen blur quality is closer to the PC's best preset. Project Cars is much improved from previous builds seen at Gamescom, and on console it's taking a seriously impressive form. The collision physics need work, and the texture filtering is a definite weak point, but Turn 10 and Polyphony Digital could have a tough act to follow in the racing sim bracket. Slightly Mad Studios also lives up to its name by letting its engine run wild; the weather system is ambitious, and the car count goes higher than any PS4 or Xbox One racer to date. However, it pays an obvious price for these options. Alas, 60fps just isn't tenable with all cylinders firing in this build. 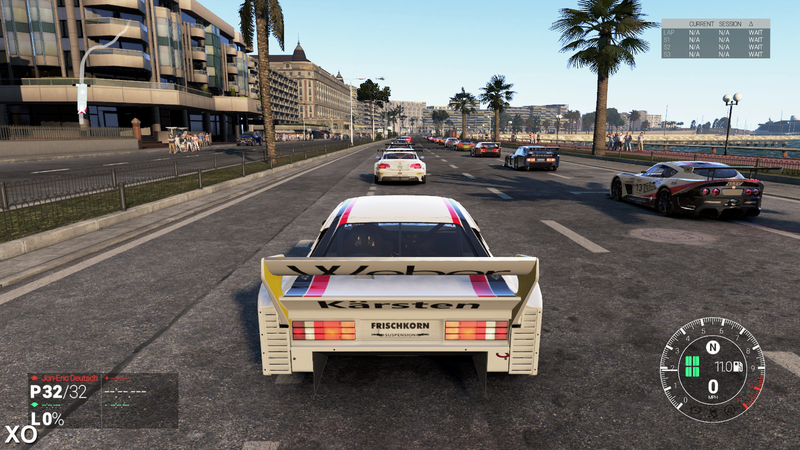 Raising the car count to 45 was always asking for trouble, and even tweaking the game's damage, weather and camera options doesn't fully stabilise its frame-rate. 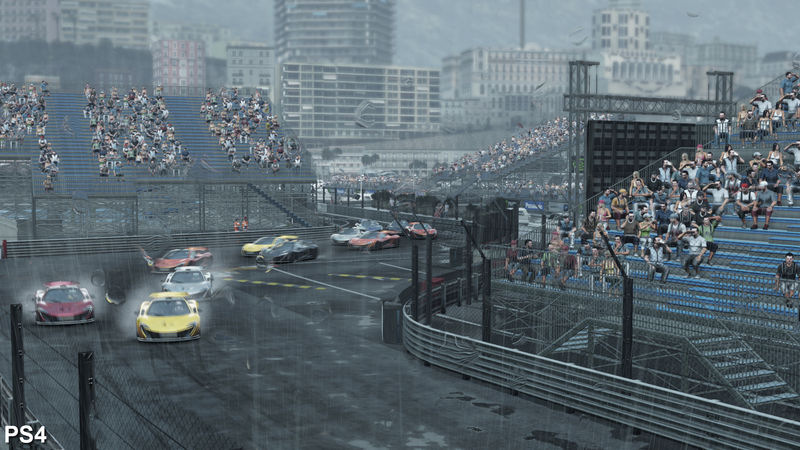 Even so, Project Cars is the most PC-like game to hit console yet; an options-rich sim that lets PS4 and Xbox One owners define their experience. Based on these early tests, the more impressive race setups are better suited for a 30fps cap - an option we hope to see added to Project Cars' already exhaustive menus.